In my case, it’s not Barber baby bubbles and a bumblebee, but BIRDS, Birds, birds! With apologies to the Dr. Seuss children’s book which whimsically teaches the ABCs in classic Seussian-style, this month in my garden has seen a variety of both upper case (BIG) and lower case (little) birds. Welcome to Wildlife Wednesday, a monthly huzzah for wildlife and also for those who garden to protect and support that wildlife. I’ve never witnessed as many up close and personal daytime raptor encounters in my own garden as has been the case for the past couple of months. During late autumn, winter, and spring, I regularly see raptors swooping through the neighborhood, scattering terrified birds, as well as soaring through the Austin sky as I make my way around town. But this past month, several have hunted directly in my back garden, with exciting, sometimes troubling, results. A gorgeous Cooper’s Hawk, Accipiter cooperii, flew into a sliding-glass door which serves as the door to my back garden. I happened to be out in the garden and it must have flown passed me on its way to the crash. I heard the thump against the glass door and whipped around, assuming that it was a Whitewinged dove, as those are the birds that typically hit the windows. 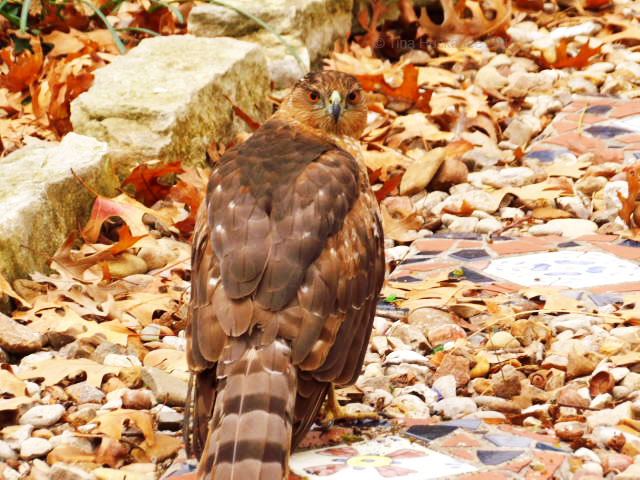 I was shocked to see the hawk on the back patio floor, a bit unsteady on his talons. He fluttered to a bench adjacent to the door, and then flew to a back trellis. I thought the hawk might be a juvenile, but the deep orange eyes suggest an adult. …this beauty flew to a neighbor’s tree and then was off again, flying well. 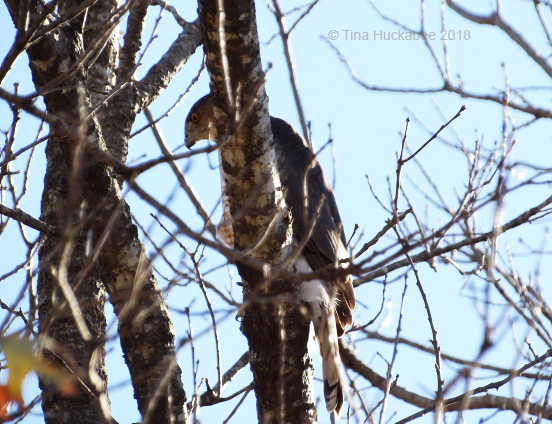 A few days later, I saw a Cooper’s Hawk in my Red oak tree; I assume it’s the same hawk, as it hangs around my house, clearly looking for bird meals. The hawk’s eyes are focused on what I realized was a dove, its targeted meal. A split second after this shot, the bird belted toward the back of the garden and with a rustle of leaves and kerfuffle of activity, a Whitewinged dove sprinted into the air and across the neighbor’s back garden with the hawk in fast pursuit. I lost sight of the two of them as they winged through trees in the ancient predator-prey dance, so I don’t know how the chase ended. I’ve noticed a few more bird strikes on my windows since I had Pella windows installed about two years ago. While I love the windows, I’m sorry that it’s created a problem for the birds. The vast majority of hits are of Whitewinged doves, and only one proved immediately fatal, but I can’t help wonder how many hit when I’m not home? And, do any die later, from internal injuries? 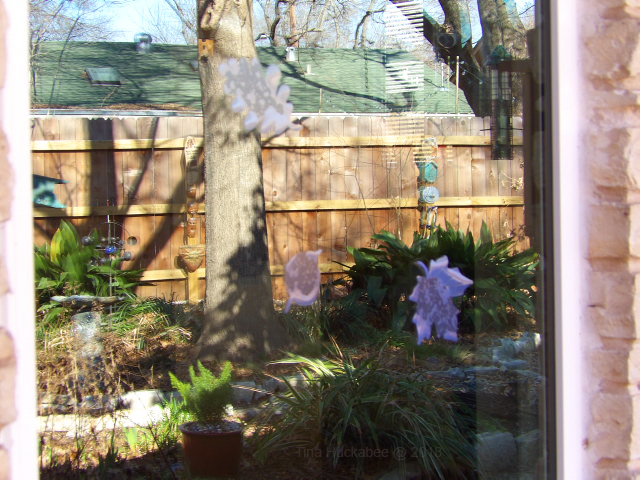 I‘ve placed “bird alert” window decals on many of my windows, though I’d never placed any on the sliding-glass door that the hawk hit; I’ve remedied that. (My back patio is covered and I mistakenly assumed a bird wouldn’t fly fast into such obviously human territory.) The reviews of these decals are mixed, but they apparently have some positive effect on the birds’ view of things. A quick look at one of my back windows gives you an idea of what the birds see. This window images part of my back garden and the back neighbor’s roof. You can also see the stickers, placed closely together. As far as I’m aware, no bird has hit this particular window, but you can see why one might. 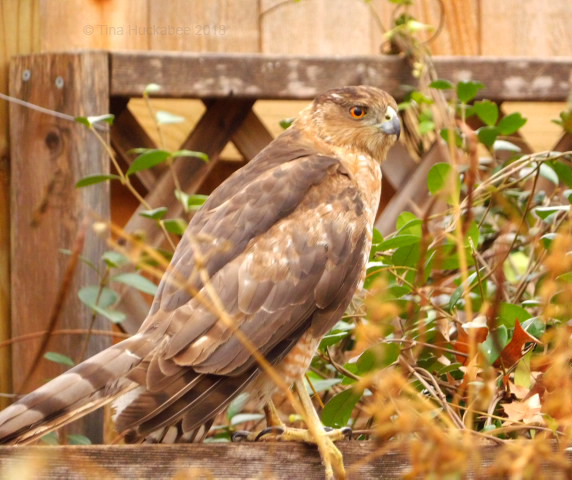 At about this time last year, I witnessed another Cooper’s Hawk chasing birds in my garden. It flew from the house to a Mountain Laurel tree (mid-garden), and then immediately whooshed back to the house, straight toward a bedroom window. The bird banked hard to its left about three feet from the window and flew off. I’d placed some decals on that particular window and have often wondered if the bird saw the decals and realized that it wasn’t open space. I’m now lowering the blinds in my windows, especially when I’m not at home, as bird researchers think that the slats help the birds to see that the window, even if reflective, isn’t open space. Another recommendation is that if you have a window with an opposite window in the same line of sight (where you can see all the way through the house) which might give birds the illusion of open space, close or lower blinds on the second window. It will diminish the look of greenery, trees and sky that birds think they see. For more information about how to reduce bird strikes, check out this article from Cornell Lab of Ornithology. 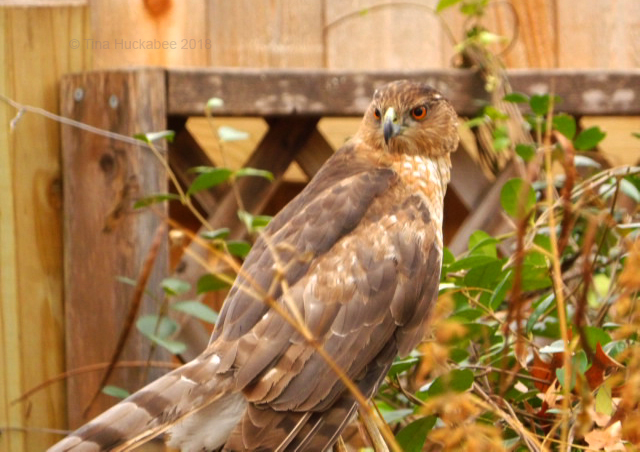 Along with the active Cooper’s Hawk, there are two Red-tailed Hawks, Buteo jamaicensis, at least one of which I’ve seen a couple of times diving through my garden in search of bird à la feathers. As well, a Great Horned Owl, Bubo virginianus, prowls at night; I’ve heard and seen it several times. I can’t tell if it’s a single, or one of a pair, but it’s big. Really big. While the predator birds have been unusually active this winter, I haven’t seen or hear any evidence of Eastern Screech Owl, Megascops asio, activity. We’ve welcomed mated pairs for the past 8 years, enjoying their parenthood antics and darling offspring. Last year, we missed hosting a pair because of an oppossum in the owl box. This year, the owl house is clean, empty and ready for the little owls, but they’re a no-show. It might be fear of the hawks or the Great Horned Owl, but it’s unusual–and concerning–for there to be no Screech owl activity this time of year. I am also concerned about neighbors who place rat bait stations around their property. Do the bait traps contain rodenticide, or substances that repel, rather than kill rodent? Poisoned rodents lead to poisoned raptors. As for the little birds, there are plenty and they are quick. I briefly witnessed this Blue-headed Vireo, Vireo solitarius, bathing in the bog and fluffing feathers in the winterized Yellow bells, Tacoma stans. I’ve seen this species of bird before during spring migration and I wondered if this one was misplaced. 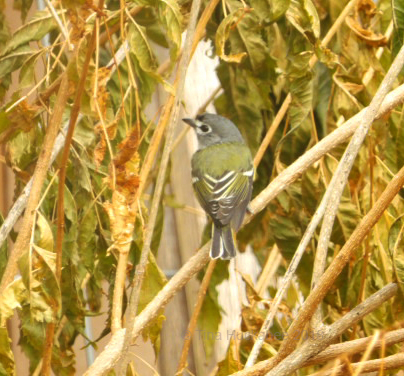 In fact All About Birds shows that Central Texas is on the cusp of the vireo’s winter habitat. He made one brief visit, but he’s welcome anytime. While on a walk in my neighborhood, I snagged a shot of a quick-moving female (?) Downy Woodpecker, Picoides pubescens. Darling little wood lovers, I’ve limited success with decent shots of these rapid-fire tree huggers; these are the best I’ve managed. Up in a tree a few streets away from my house. Nibbling at the suet feeder in my garden. 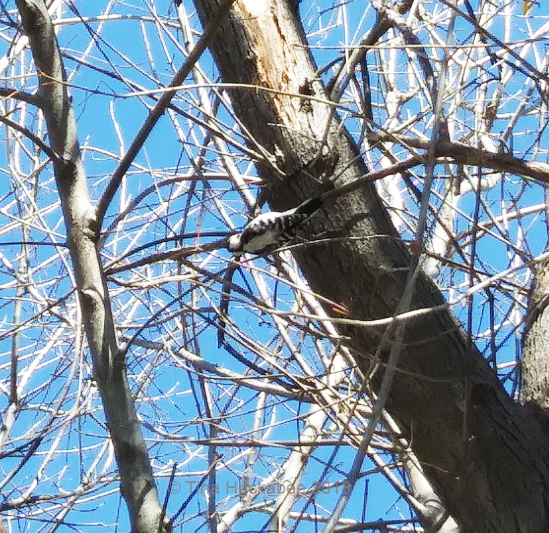 Downy woodpeckers sing a charming chirp and are common in my neighborhood, but apparently, shy with bird paparazzi. 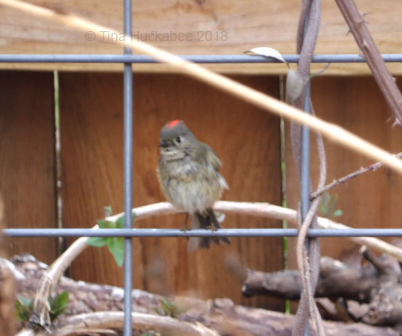 As for poor quality bird photos, I’m posting these of a Ruby-crowned Kinglet, Regulus calendula. My current camera, coupled with a bordering-on-a-character flaw lack of patience, removes any expectation of achieving clear shots of this tiny dynamo, topped by a flaming red cap, so I’m going for broke on photos of this bird and not fretting over the less than stellar quality! Look at that red, albeit smeared, head! Males like to flash their color when they’re defending territory, impressing ladies, or expressing annoyance. This one likes to bathe in the bog, then fluffs-n-dries in the adjacent Yellow bells shrub. When he’s fluffing and drying, he’s as still as he gets; otherwise, he’s constantly on the move for insects. This shot of him in the bath is, well, at least clear! I assume there’s no red crown because he’s relaxed and enjoying his bath. 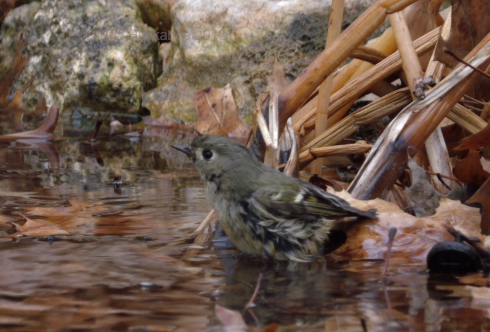 I’ve seen two of these itty-bitty birds simultaneously, but usually there is only one in the garden or at the pond at any point in time. Other little birds regularly visiting are finches. 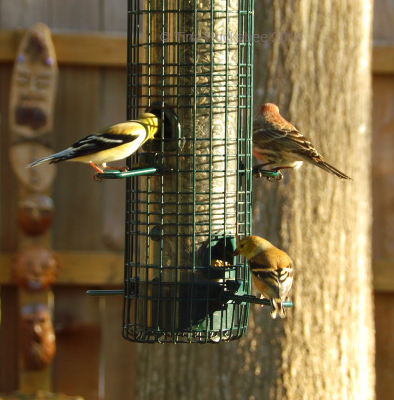 Lots of finches. 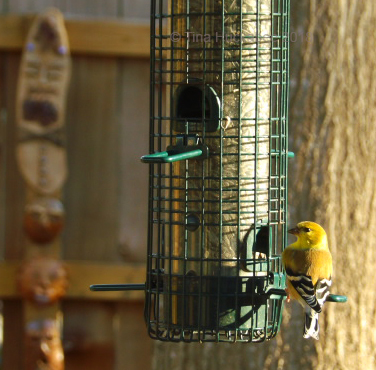 One American Goldfinch, Spinus tristis. He has the food bar all to himself. Two Americans, plus a House Finch, Haemorhous mexicanus. This food bar is becoming popular! 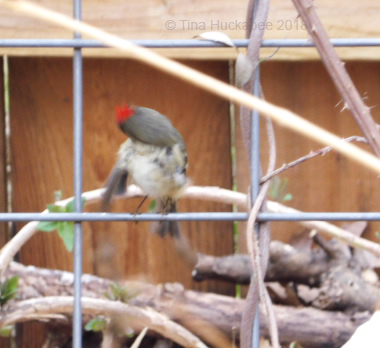 Three Americans, a House, and an upturned tail feather owner–probably another House Finch. The sign of a successful eatery: long waits before seating! 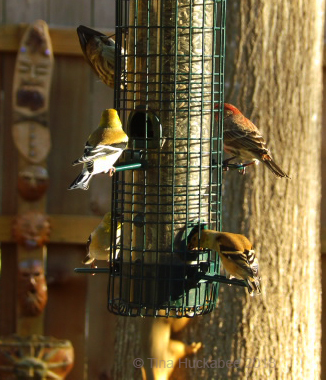 I can’t help wondering what rhyming silliness Dr. Seuss would posit about these feeding finches. The resident birds and winter visitors represent garden life in this dormant time of year, adding color, interest, and activity. Who’s visiting your garden? Please share your photos and stories of wild critters this past month. Remember to leave a your link when you comment. This entry was posted in Uncategorized, Window bird decals, Window bird strikes and tagged Widlife gardening, Wildlife We, Wildlife Wednesday by Tina. Bookmark the permalink. Great shots of the hawk. I had one hit my window that had blinds, but I think it was focused on its prey. The other day I was standing in my back yard and one by one feathers started floating down from a tree. I couldn’t locate the source, but I’m sure the hawk had gotten his prey that day. I’m sure the hawk was focused on the prey–was it okay? (At least as far as you could tell?) So far this winter, I haven’t directly seen a successful hunt, but there’s plenty of bird matter around, so I’ll bet the hawks are eating just fine! The hawk flew off and I think it missed the birds. Oh man, that’s sad. I’m not fond of starlings, but to poison anything is an appalling act. One of the houses where I’ve seen the rat bait stations was recently sold and has closed. I suspect it was probably the realtor who placed the stations. I happen to know her and she wouldn’t be fussed, or even understand, the interweavings of wildlife. I have put in visual marking tape from FLAP (fatal light awareness program) on 2 of my windows and not had a strike on either since. For my sliding door and front window, I have the decals like yours, although I am not sure how long the UV reflection will last. Perhaps I will put in acopian blinds at a later date. Their site dicusses a variety of options, including diy: http://www.flap.org/residential_new.php. I wish there were easy, universal ways to avoid strikes. They are heart breaking. Thanks, Laura–I’ve heard of visual marking tape–thanks for the suggestion and the link. The decals I’ve used recommend changing them every 6 months, or so. I’ve been replacing the old ones with new at the beginning of both spring and fall migration. Tina his post and his photos are magnificent, even those that qualify as out of focus, but are pictures of birds that are not still and pick them up so it is a success. I’m glad that day birds of prey visit her very often, like poor Cooper’s Hawk that crashed into the windows. Thank God he was unharmed. It is wonderful. There is no right to poison rat poison so that then a bird of prey catches an poisoned rat and the bird gets poisoned and dies. It would have to be regulated for the sake of wildlife and stray cats or not. I have wooden shutters in the country house or very thick curtains that do not let in the light. We do not have the honor of harboring birds of prey in our garden, but there are pigeons from a nearby dovecote and clueless birds that have gotten into the house. Too bad you do not have garish owls not to nest, they have not, but in your garden. The Great Horned Owl that prowls at night must be a marvel to see and hear it. I love all the birds. The blue-headed Vireo is beautiful. 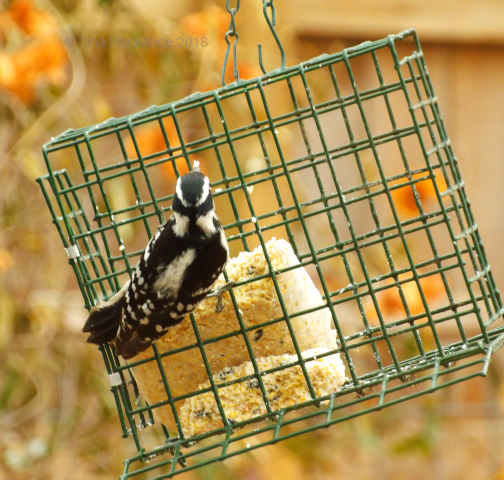 Downy Woodpecker is very beautiful and also sings! Regulus calendula with her red hat is cute. 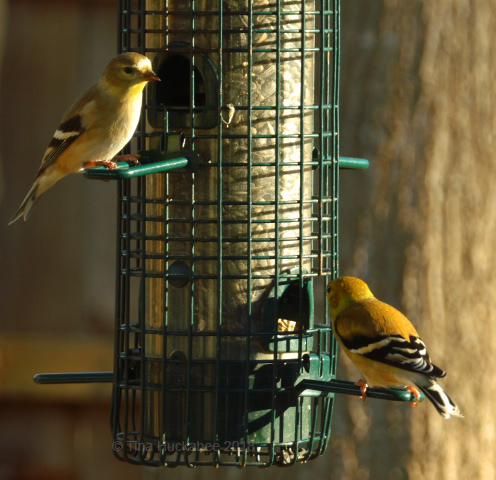 The American Goldfinch has divine colors. The House Finch is beautiful. Happy Wildlife Gardening likewise. Have a nice weekend. Greetings from Margarita. Thank you, Margarita! I’m sorry you don’t have birds at your country home–but at least the dove give you something to laugh about! Have a nice weekend! Thanks, Frances–it’s fun to have them around. Hi Tina, that Coopers Hawk is a beautiful looking raptor. How awesome to see it in your own backyard, but not so good about it hitting the glass door. Glad it seemed to be fine. And bad news about your neighbour putting out rat bait. Surely they could think of a better way to deter rodents. It’s not only cruel for the rats but other birds and animals can also get sick and die. We had a similar problem with a neighbour as the rats ate their bait then came to die on our property and we noticed kookaburras eyeing off an easy feed. We disposed of the ones we found, but who knows how many others died elsewhere and may have been consumed by the kookas or birds of prey or even snakes. People need to see the big picture and understand the consequences of their actions. Here’s my post for January. The Cooper’s Hawk really is a beauty. He/she was annoying the Blue Jays when I got home today, so its still around! I couldn’t agree with you more about the rat bait poison. I sure hope it hasn’t impacted our screech owl population in the neighborhood, but I’m concerned that there’s not activity. Fingers-crossed that they’re just keeping a low-profile and I’ll see or hear some soon. I’ll bet the shades are a good bird-strike deterrent. I hope the raptors steer clear of the windows and as for the doves, well, the good news is that the feeder the bolt from is close, so their hits are not with much impact. I really should get around to writing about what those finches did in my dining room. I just do not have any pictures for it. I really am not good with pictures. Yes, or conversely, rather than it being a blog post, maybe a short story! It is too short; just quite amusing. Thanks, Allison! Isn’t that Cooper’s a beauty? There’s another common hawk which looks similar, the Sharp-shinned and I always have to look at photos to make sure I’ve identified the correct one. I hope that I can eliminate strikes, but it seems like the best one can do is to limit. Birds flying into windows is such a sad predicament. A friend just reported hanging old CDs outside her windows. They catch the light, and create little rainbows inside her rooms. I think that sounded rather cheery – and it reminded me of my grandmother’s crystal chandelier which did the same thing. I thought about using CDs, but I think lowering the blinds and the reflective stickers are helping–for now, at least. Thanks for this post! I knew I had a red-shouldered hawk around my office but hadn’t identified his friend and it definitely resembles a Cooper’s hawk. It’s easy to watch the raptors now–they’re active and some of the trees are bare. The Cooper’s is very similar to the Sharp-shinned and I always have to look at photos to compare. I laughed at both the CDs and imitation owls as deterrents — not because they’re inherently bad ideas, but because the birds become so used to them, they become ineffective in a short time: like, three days. There’s a constant battle between boat owners and birds down here, and the lengths people will go to in order to keep the ospreys off their masts, the herons and egrets off their docks, and so on and so on, are remarkable. Cds, owls, snakes, wind chimes — they’ve all been tried. The birds just laugh. Over at our HEB, they installed owls all along the roofline to help keep the grackels away. The last time the grackels came through, there was one perched on top of every owl. Oh, well. Years ago, I had a bird feeder in a tree in the front yard. I couldn’t figure out why there were so many feathers on the ground, or so much fluttering around from time to time. Then, I found it. A hawk of some sort was lurking on the luggage rack of a resident’s car. It would sit there every day, where it had a straight shot in to the feeder. Clever hawk, but more clever human, who moved the feeder. I found an American kestrel feeding on a young nestling down at the wildlife refuge a couple of weeks ago. I assumed it had caught a mouse or something, until it became clear what it was. I couldn’t figure out — and haven’t yet found out — which birds would have hatched babies already. But this one was already down-covered, so it had been out of its secure little egg for some time. More research is necessary. Okay, I’ll embarassingly put the CDs back in the box. 🙂 Thanks for this and that’s really interesting; I wondered if birds might become habituated the dingly-danglies in front of the window. American kestrels! Oh, sigh, I think they’re just the prettiest birds! I don’t think I’ve ever seen on in the wild, only at bird sanctuaries. At the NPSOT meeting last night, a birder told me that the kestrel’s snack might have been a rail. There have been some reports of rails and babies around. It still surprises me — seems too early. But they know how to be birds! I thought of you this morning when I read this post, and thought you might enjoy it. If you don’t know her website (I may have already mentioned it) it’s splendid, and her galleries are terrific aids in identifying species. Despite her location, we have a lot of birds in common. Ah, that’s interesting. LIke you, I would think it’s a bit early for family-time, but I suppose the birds know best. Thanks for the link to her site–wow!, great photos! It’s a thrill to see any raptor up close, but owls–that’s a special gift as they’re so elusive. I haven’t seen the Great Horned in about two weeks; I always become concerned, but it’s wasted effort, I suppose. 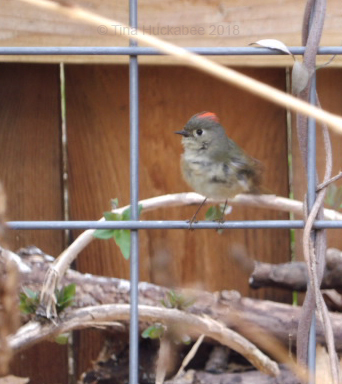 Amazing photos of the Ruby Crowned Kinglet – we can never capture images of those with the camera. Ditto those hawk pictures! Thanks! The Ruby-crowned are so hard to get! I watched one for a long time yesterday, trying to get a good shot. Nothin’! Very cool! I put out a feeder but haven’t had any takers. I think it’s time to add/buy fresh seed. But there are lots of birds in the trees around my garden. But I do miss seeing them at my feeders. Off to the store I go….! I guess your little feathered friends are finding what they need in the trees. Sometimes that happens to me as well, especially if it’s been a while since I put seed out, they’re a little shy at first. Usually, they get over it! We put our Screech Owl box up a couple weeks agp. We’ve had a Black Capped Chickadee check it out. We had a Swainson’s Hawk in our yard a few weeks ago. It flew off and the next day a Swainson’s Hawk tried to attack a nest of Eaglettes. We have two nesting pair of Bald Eagles close to where we live and over 35 Eagles in our community. The adult Eagles chased the Swainson’s Hawk off and I was stunned at how much larger the Eagle was in comparison. Wow! You have lots going on in the raptor category. Eagles really are huge–I can see how they dwarf even other large birds.